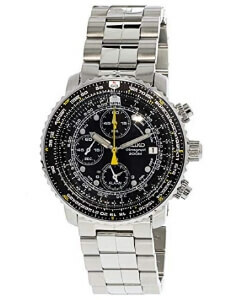 When looking for the best watches for pilots, an individual wants a timepiece that will make the flying experience easier. It should have the necessary features, be very accurate, and will handle the high pressure well. In addition, the watch should have good visibility even in low-light conditions. The following are some products that meet this description. This watch doesn’t feel too heavy on the hand. It, however, is very solid and durable thanks to the stainless steel case. It fits nicely on most wrists and doesn’t look too bulky or too small. Besides, the 48mm case has a smooth finish which doesn’t dig into the skin or make the section sweaty or stuffy. The digital display is clear for easy viewing. In fact, many consumers say it’s more user-friendly in comparison to the analog type. To improve visibility in the dark or low-light situations, the hands have good luminosity. It’s very flexible and feels nice on the skin courtesy of the polyurethane band. The Seiko SNA411 features a range of functions to make the pilots’ life easier. They are all well-placed on the dial and don’t look too cluttered. The silver tone-hands standout from the black dial and viewing time is much easier. In the dark or dim-lighting, the hands and markers illuminate thanks to the lume. It feels sturdy and handles vibrations, impact, regular movements, abrasion, falls and other things relatively well. The stainless steel case and the Hardlex dial are some of the reasons that give it longevity and reliability. 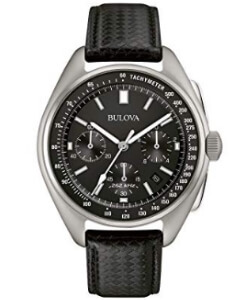 For a man’s watch, it has a nice diameter of 42mm. This timepiece gets a nod for its sturdy construction and high performance. The stainless steels case should handle everyday use, exposure to moisture, high pressure, and other things. And being stainless steel, it doesn’t rust, fade, tarnish, or corrode. The 43mm diameter fits perfectly in a man’s wrist and doesn’t look too slim or bulky. The good experience is enhanced by the smooth finish which also doesn’t leave marks or make the skin sticky or sweaty. Thanks to the sapphire glass, the possibility of the face cracking, shattering, getting scratches, or losing clarity is very minimal. Also, it is less affected by glare but still has decent visibility in low light. Flying can be strenuous at times. The last thing a pilot wants is to deal with a watch that seems to bog/ weigh him down. A good timepiece will be relatively large for easier viewing of the many functions. However, it will be moderately light. To achieve this, manufacturers try it use lightweight material. Another approach is to make it thinner. For instance, you will find most men watches having a diameter of between 40-44mm. However, they will feel lighter than normal watches. Lighting in a cockpit is normally not as bright as in a normal setting. The darker settings allow the aviator to see the controls and consoles better just like in a car. In such a situation, it is essential for the watch to be readable even in the low-light situation. A good choice will have shiny or bright hands, and markers while the background or dial will be dark. The higher the contrast the more visible the functions. A good example is white or silver-tone hands against a matte black dial/ background. Incorporating glowing lume on the sticks and markers is also a step in the right direction. 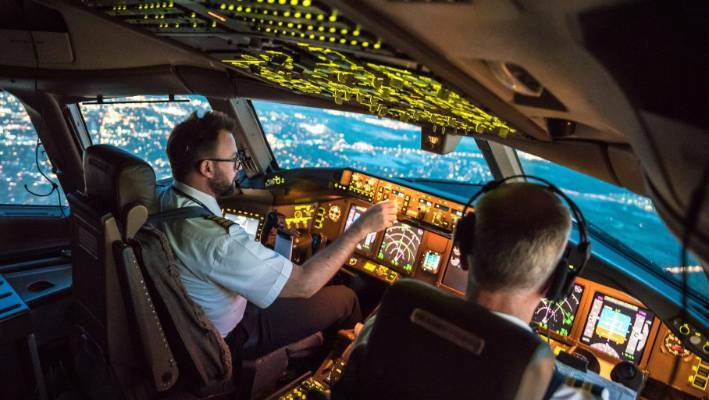 The pressure inside a cockpit or the airplane, in general, is higher than normal. This due to the pressurized nature. A weak watch is likely to develop leaks, crumble under pressure, and lose its effectiveness. 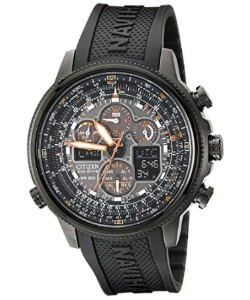 A good watch for pilots will handle extreme pressure well. The case will be made of tough materials such as stainless steel. The crystal will comprise hardwearing and shatterproof material such as sapphire. The seams around the crystal will be airtight to prevent entry of moisture. Just like the case and mineral, the strap/band, bracelet and buckle are also made of tough materials. A pilot needs to have accurate information about the position, time, flight path, changing time zones, and other things. It’s essential for a watch to be highly accurate to prevent chances of miscalculation. Top watches have fine clocks that lose only a few seconds in a month. The frequency will be high and this improves precision. Japanese and Swiss movements are the most common.